I’ve used a variety of digital SLRs over the years in a seemingly endless quest to capture my daughters in action. Whether indoor sports (volleyball), nighttime marching band, or winter guard inside dimly lit gyms, I believed I fought for better low-light captures. Each camera body upgrade and better quality lens netted slightly better image quality in low light. I was so, so wrong about my photographic priorities. I wrote about the D500’s impressive ability to minimize noise in an earlier post by improving the quality of the noise. That’s great, and the D500 has met my expectations. But a recent trip to a local nature preserve resulted in an epiphany. I thought I sought better image quality at high ISOs so I could shoot at higher shutter speeds, but really, I wanted better quality focus. Even high shutter speeds can’t help if the image is out of focus. 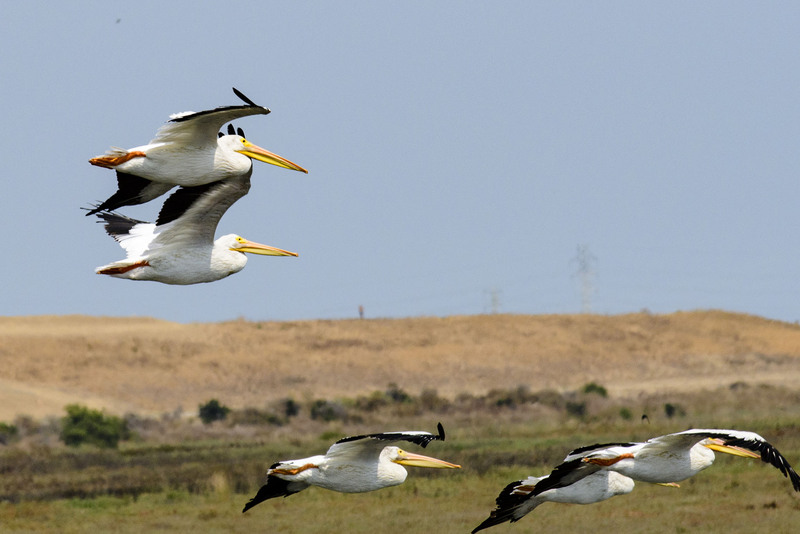 Let’s take a look at some photos of pelicans to illustrate the point. 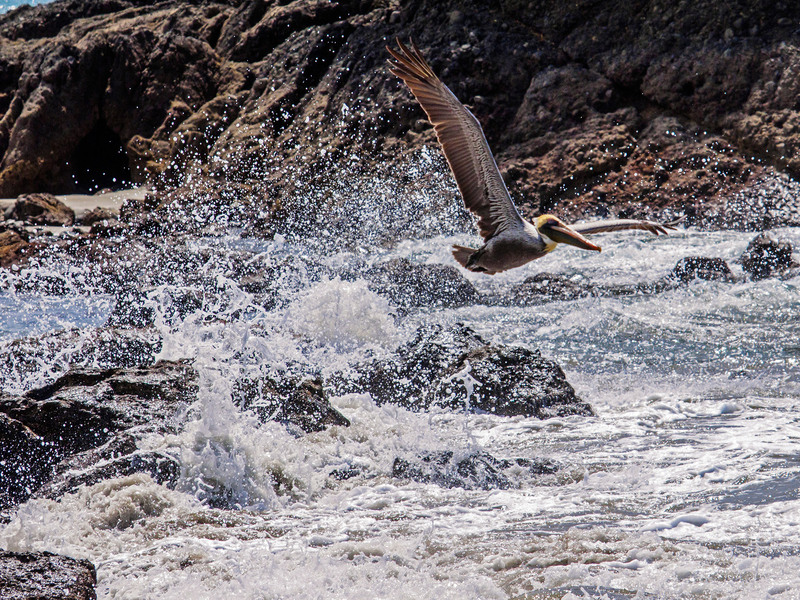 We’ll begin with a pelican I shot in Costa Rica, using an OM-D EM-1 micro 4/3rds camera. I used the excellent M.Zuiko 50-200mm f/2.8-f/3.5 SWD zoom with a micro 4/3rds adapter. That’s a great shot of water crashing against the rocks on a beach in Costa Rica. 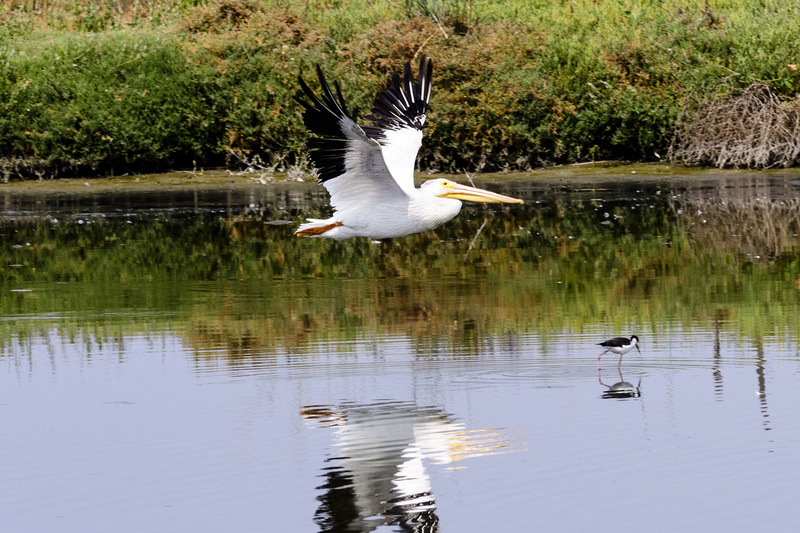 It’s not such a great shot of the pelican, which is just a tiny, tiny bit out of focus. 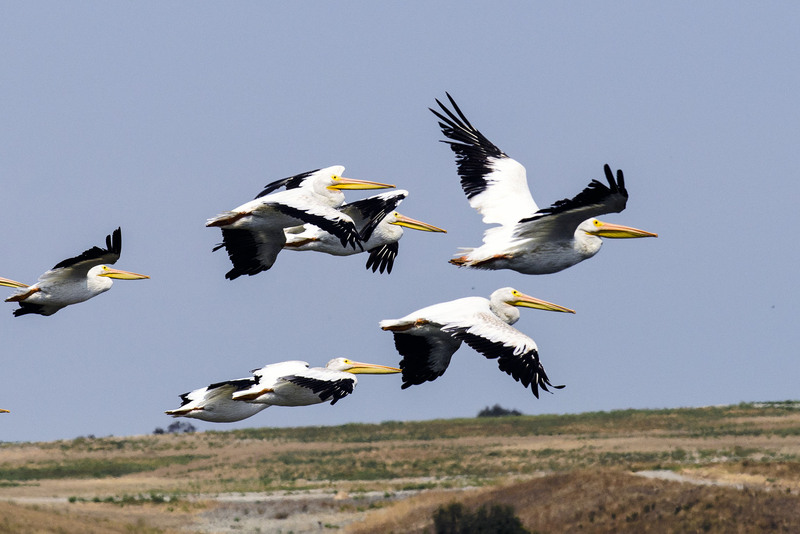 This turned out to be the best of about two hundred photos of pelicans I tried to shoot. I’m the first to admit I’m no expert at shooting birds in flight, but I did spend years shooting fast-action sports. I’ve gotten superb landscape, product photos, and portraits with the OM-D EM-1, but action photography success proved elusive. Bear in mind that using the micro 4/3rds adapter meant using phase-detection AF on the Olympus, arguably faster and more accurate than the contrast AF normally used. Okay, that’s better — a lot better. At f/7.1 and 1/1000th at ISO 200, this quick capture turned out okay, though at pretty long distance. Even with the 70-200, I needed to crop substantially. So I shot some more. Bear in mind that I shot these pretty casually, without really trying particularly hard. The D500’s AF did the rest. I felt a little like an old-west gunslinger, pulling the camera up to my eye and shooting whenever I saw a bird move. Nikon’s own marketing talked up the autofocus performance, but that’s nothing new. Every time a new Nikon body ships, Nikon hypes the new features, with the latest AF module always being part of the pitch. Each time, what you really get are incremental improvements to AF. I think this time, Nikon didn’t exaggerate. The AF in continuous mode really is something special. I got some pretty good results just casually shooting. I think next time I’ll try harder. Nice! What autofocus mode were you using here? I was in continuous AF mode, shooting at 10fps.